The beige walls surrounding the small cubicle were the first clue she didn’t belong. But it was Carin Rockind’s first job. She hadn’t yet learned what she needed to know. Everything had fallen into place for the University of Michigan graduate. She had married her college sweetheart. They bought a big house and brought home a dog. She was starting a career in automotive marketing. She had everything she wanted. Finding happy, finding purpose. Photo courtesy of Carin Rockind. She would stay in the industry in a variety of roles for more than 15 years. Because that’s what you do. All the while, she couldn’t put her finger on what was wrong. Her marriage was the first to feel the stress. A therapist suggested she look at switching her job before ending the relationship. Ultimately, both suffered. She divorced at 26, an age when most of her friends were starting marriages, not ending them. No one could relate. She needed to find a new and supportive community. She found one on an internet message board called “Divorced and Under 30.” Soon after, Carin became the leader of the group, an empowering voice to others in the same situation. Around the same time, she began volunteering with high school girls, helping them curb their self-deprecating talk. And something about those roles felt so right. But she didn’t know how to create a business and monetize what was essentially a feeling. So she stayed in her day job to pay the bills while actively considering what she might do next. She started with a list of regrets that became a bucket list. She had never been abroad. With her boss’s blessing, she took a month off. She spent it in Paris. She wrote a book about divorce and submitted it to a literary agency. She trained for and ran a marathon. Yet, she still didn’t make the lasting changes to lead her life in the direction it was begging her to take. And things kept going wrong. When a boyfriend proposed (“Another lawyer with a BMW,” Carin says), rather than elation, she felt ill. The relationship broke up. Her book was rejected by William Morris. She gave up on the idea of getting it published. She got sick with shingles. She went back to her therapist, wondering if she might be bi-polar. The therapist suggested an alternate cause for her ailments. Perhaps her feelings were the result of not following her dreams? It made sense. And yet, Carin still felt she had to stay the course of the life that had been prescribed for her – a good job with a solid paycheck. Until she was robbed at gunpoint. In 2008, in the vestibule of her building, returning home from a “bad blind date,” Carin found herself staring down the barrel of a gun. Her instant fear was followed by a moment of great regret of all she had been putting off and all she had been wanting but waiting to do. Quietly and quickly, she made a pact with God. “I said ‘If you get me through this, I’ll start living my life with purpose’” she says. The robber grabbed her purse and ran. She stayed true to her promise. First, Carin looked to enroll in an MFA writing program, one in a city in which she’d always wanted to live, maybe New York or Philadelphia. She was rejected from every single school she applied to. “I didn’t let it get in the way,” she says. Instead, she enrolled in graduate program in Positive Psychology at the University of Pennsylvania, a relatively new course of study at the time. It reminded her of the work she had loved with those high school girls. She left her six-figure job as a VP in marketing and started life over as a “poor grad student” at the age of 36. Her family, at first, didn’t understand. Her father initially called it the “stupidest decision” he’d ever heard. “It turned out to be the best decision I ever made,” she says, noting that he’s come around too. During her time as a student, she approached a professor and offered to be a teaching assistant, which led ultimately to having her own class. She took the occasional corporate job too, to earn enough money to get herself through school. 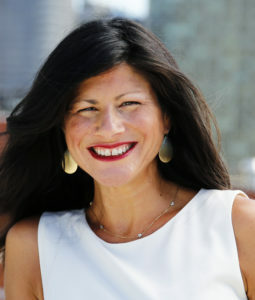 Carin launched her coaching and speaking business in 2011 – PurposeGirl – (carinrockind.com), conducting one-on-one coaching and running programs for women at conferences and retreats throughout the world in places like Mexico and in Greece. Her corporate contacts helped her get speaking engagements which led to a regular guest spot on Wake Up With Taylor on Sirius XM which ran from 2013 until 2017. Leading a retreat exercise. Photo courtesy of Carin Rockind. Carin describes a typical client as someone in mid-life, an age range from 30-50, who did “everything she was supposed to do and still winds up unhappy.” She works with them to help uncover what they love and find the strength to pursue it. As for the path that got her to her purpose? Carin feels it was a road she was meant to travel. Daily Ritual: When I wake up, I say a “thank you” as I get out of bed. My morning also includes swishing coconut oil, walking my dog, stretching and meditation. How do you get Unstuck? I was stuck so many times, so each time was something different and required a different solution. For people who feel stuck I suggest hiring a coach or finding a community to support you and hold you accountable. Spend more time on self-care. Don’t give up on your goals or waste precious time. What’s Next? I’m launching The PurposeGirl podcast and have a publisher for my book! I’m also interested in programming to address and eradicate women’s depression. What advice do you have for others looking to create their own next chapters? Pause, step back, and go inward to get clear on who you are and what lights you up. You have to get out of your head (which is full of “should”) and into your heart (which is full of desires and purpose). And once you have an inkling of your purpose, or an idea that won’t leave you alone, take action. One step isn’t a lifelong commitment, but if you don’t take it, you’ll end up in regret and possibly sadness. Want more “Next Chapter” inspiration? Read how Christine’s “Just Say Yes” philosophy opened multiple chapters, how Nicole’s commitment to diversity is reflected in her career and why Aurelia left a “sweet” job to find another! Valerie Gordon put stories on television for years. Now, as the founder of career and communications firm, Commander-in-She, she helps women capitalize on the power of their own stories for greater success and satisfaction at work. If you know of someone who should be featured in the “Next Chapter” series, please email info@commander-in-she.com.